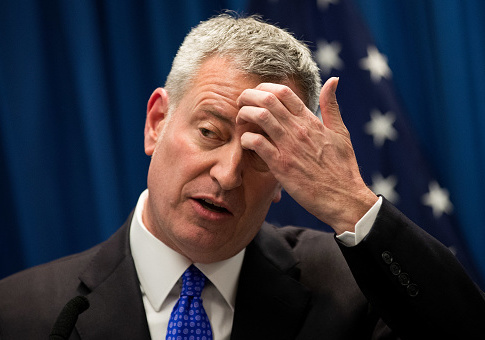 The office of New York City Mayor Bill de Blasio is under fire after the mayor's press secretary fueled a rumor about immigration officials going after a fourth grade student in a city school. Press Secretary Eric Phillips tweeted Saturday that de Blasio had been briefed about federal immigration agents showing up at a Queens school and demanding information about one of the students. While Phillips never said why the agents were there or which agency they were with, his evident distaste ("A 4th grader") led Twitter users to assume the ICE agents were looking to deport the child. FBI & DOJ employees cling to their principles. But with ICE, all Trump had to do was drop the leash. @EricFPhillips Rounding up the most vulnerable for what reason? To make the #'s look good? Kudos to PS58 for protecting our kids. The official Twitter account of New York City even shared Phillips' tweet. But the New York Times revealed on Tuesday that the social media hysteria about immigration agents swooping into city schools to deport children was yet another example of fake news. The Times chastised the mayor's staff with the headline, "City Hall Spreads ICE Fears First, Gets Facts Later." The agents in question weren't ICE agents, but they were fraud investigators with United States Citizenship and Immigration Services, the Times reported. The investigators were not looking to seize or deport the child. A U.S.C.I.S. spokeswoman said that agents only wanted to confirm the child's enrollment to determine whether the parents qualified for an immigration benefit. Upon learning the student wasn't enrolled, they left. Phillips defiantly blamed ICE when confronted by the Times about his role in fueling the hysteria. "I think ICE has fueled the fire," he said. "Immigration agents, really for any reason, showing up in our elementary schools is alarming. ICE’s enforcement efforts, broadly, are alarming." This entry was posted in Politics and tagged Bill de Blasio, Eric Phillips. Bookmark the permalink.